The Union Minister of Agriculture & Farmers’ Welfare, Shri Radha Mohan Singh today launched six new features of National Agriculture Market (e-NAM) Platform to make it more users friendly.Shri Gajendra Singh Shekhawat, Union Minister of State for Agriculture was also present at the event. e-NAM is one of the major and important flagship schemes of the Government of India which is being implemented by Ministry of Agriculture & Farmers’ Welfare with the objective of providing competitive and remunerative price to farmers for their produce through online competitive bidding process. Addressing the gathering, Shri Singh said that it is the dream of Hon’ble Prime Minister, Shri NarendraModi to double farmers’ income by 2022 and that farmers should become part of mainstream development. 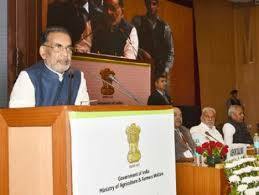 He said that the objective was to bring more transparency and competition and provide remunerative prices to farmers. Keeping in view the need of making marketing of commodities easier for farmers, e-NAM was envisioned and launched in 21 Mandis on 14th April 2016 which has now reached 479 Mandis across 14 states and 1 Union Territory. e-NAM website is now available in eight different languages (Hindi, English, Gujarati, Marathi, Tamil, Telugu, Bengali and Odia) while the live trading facility is available in six different language (Hindi, English, Bengali, Gujarati, Marathi & Telugu). The Minister said that the agriculture ministry is now strengthening e-NAM platform with new and user-friendly features by rolling out MIS Dashboard for better analysis, BHIM payment facility by traders, mobile payment facility by traders, enhanced features on Mobile App such as gate entry and payment through mobile, integration of farmer’s database, eLearning module in e-NAM website etc. Mobile app is being enhanced in multi-dimension so that the entire operation for farmers and traders can be user friendly. Mobile app has been made multilingual. Now the Mandi operators can carry out one of the critical operation of Gate Entry directly from e-NAM Mobile App. This will also facilitate the farmers to do advance Gate Entry on Mobile app which in turn will reduce a lot of time for farmers coming in the Mandi and will bring huge efficiency and facilitate smooth arrival recording at the Gate. A new feature has been introduced for farmers where they can see the progress of their lot being traded and also real time bidding progress of price will be visible to farmers on Mobile App. During the trade, facility of viewing the assaying certificate is made available to traders on the mobile app. Now, online payment by trader (buyer) can also be done from e-NAM Mobile App through debit card and net banking. This will help buyers to transfer the payment directly through the App and make it easier for traders in online payment to farmers. Also, SMS alert to farmer on receiving payment in their bank account will be sent thereby helping farmers in getting information of payment receipt. Currently e-NAM portal facilitates direct online payment to farmers through RTGS/NEFT, Debit Card and Internet Banking. Facilitation of Unified Payment Interface (UPI) through BHIM is another milestone in easing out payment to farmers which will also reduce the payment realization time from buyers’ account to the pool account and in turn disbursal to farmers. A new website has been developed with improved and more informative features like live status of markets of e-NAM based on gate entry, latest information on events, dynamic training calendar etc. Also e-Learning module in Hindi language has been designed and incorporated in the website so that various stake holders can learn online about how to operate the system and continuously get trained on the system at their convenience. Currently the module is available in Hindi. MIS Dashboard based on Business intelligence will provide a greater insight into the performance of each Mandi in terms of arrival and trade. This will help the Mandi Board officials and APMC Secretary to compare the performance of each Mandi on daily, weekly, monthly/quarterly and Year-on-Year Basis. This will also enable officials and Mandi Secretary in doing actual trade analysis from commodity level to State level operation. This will also be beneficial for the Mandi Board and Mandi Secretary in planning and coordinating their operation post historical analysis. This system will help Mandi Secretary to raise technology issues related to portal/ software and its operation and also track the status of redressal of their query online. e-NAM has been integrated with Central Farmer Database so that the registration process becomes easier and Identification of farmers can be done easily on arrival at the Mandi Gate which will increase the efficiency and reduce queue time. This will help in managing the load at the Gate more efficiently during peak time in Rabi and Kharif and reduce waiting time for farmers at the entry gate.